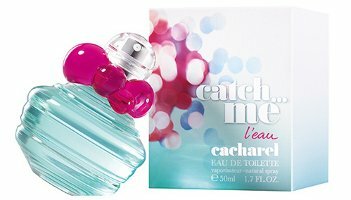 Cacharel has launched Catch Me L'Eau, a new limited edition perfume for women. Catch Me L'Eau is a flanker to 2012's Catch Me. Also new from the brand: Anaïs Anaïs Premier Délice. Catch Me L'Eau is described as a 'playful gourmand cocktail' and features notes of jasmine tea, mandarin, petitgrain, star anise, orange blossom, musk and maté tea accord. Cacharel Catch Me L'Eau is available in 50 ml Eau de Toilette, and can be found now at Nocibe in France. I may have to try this. Like the combo on notes, especially the anise. Cute bottle! The notes actually sound great to me…if you try it, let me know if it is good! +1 on the notes, we like our tea, I see:).